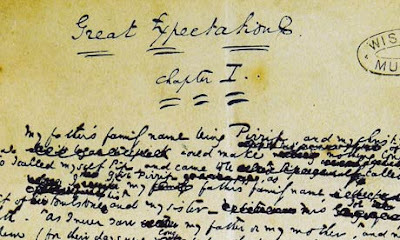 "Dense with ink, a spider web of crossings-out, rewritings and even text-speak, the manuscript of Charles Dickens's much-loved novel Great Expectations – which has been published in facsimile for the first time – offers a unique insight into the mind of the great novelist. Dickens bound and gave his manuscript of Great Expectations to his friend Chauncy Hare Townshend, who bequeathed it to the Wisbech and Fenland Museum in 1868. Fragile and in its original binding, the 1861 manuscript has been at the museum ever since, available to view on the first Saturday of every month but otherwise kept in a safe. Now the museum has worked with Cambridge University Press to scan and reproduce the manuscript in book format for the first time. It shows Dickens's terrible handwriting, how his lines sloped down to the right and how he would squeeze a few extra words into the space this left at the bottom of a page, and his notes on the times of the tides, crucial to Magwitch's capture at the end of the book. 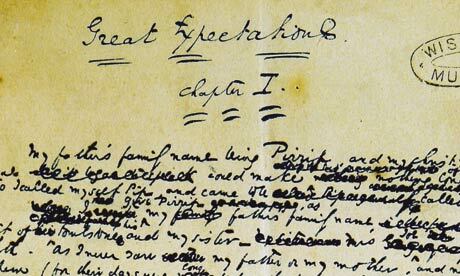 [...] the last page of the manuscript reveals part of Dickens's original ending to the novel, in four lines crossed out by the author. Dickens was told to change his sad ending, in which Pip and Estella part forever, by his friend and fellow novelist Edward Bulwer-Lytton. "You can see the beginnings of the original ending," said Wright. "He's boxed it and crossed through it with vertical lines, confirming that a different version of the ending was written. What we don't know, however, is what happened to the remainder of the manuscript with that different ending." The manuscript also shows the final sentence of the novel to have been, originally, "I saw the shadow of no parting from her but one". When the story was published in 1861 in the periodical All The Year Round, the two final words had been cut."